I will use this page to update you on what's going on with Erin. I will date the entries so you will know when I have updated this page. Also, I would like to say thank you to all of you reading this - your kind words of encouragement, either here in the guestbook, or through email or facebook, or by talking to one of the older three, you have all really helped us. It is good knowing we are not really alone! Last summer we started using Charlottes Web CBD oil for Erin. It was a huge success! She was having less seizures and when she had a seizure it was not as severe. She even had 1 -2 seizure free days per week. She was sleeping better and was not in the "fog" that seems to hang over her. Sometime in late December her seizures started to increase in frequency again, so we upped her dose (with doctor's recommendation) and continued going up until early May. Seizures kept getting worse over this time, Erin even had 1 week in March where she stopped talking and basically slept on the couch in the fetal position for 18 - 20 hours a day. The neurologist said this was a emotional mental breakdown. Whatever it was it was scarry! And there was nothing we could do to bring her out of it. At about the day 5 mark she started to talk again a little and was moving around more day by day. It was probably about 2 months later that she was completely herself again. She has had some behaviour issues since then - yelling and angry. Although this is all part of how her brain malformation makes her who she is, it sure is hard dealing with her when she is in such a state. She can be so sweet that when she gets in these angry meltdowns, it sure takes a toll on us. The CBD doctor that is helping was on holidays at that time so I called Charlotte's Web directly for help. I wish I had done that sooner! They have been an incredible help and resource! It turns out that Erin was over saturated with the oil, which has the opposite effect on seizure control. So we took her off the oil and waited, watching for seizures to decrease. We stopped the oil in May and it took till mid June to see a difference! We havent started her back yet, and here's why. So back to the CBD oil. We have decided that we will give the implant time to show us what it can do before we add the oil again. We will add the oil again! Our goal is between the VNS and the CBD we can get her off of the meds that are causing all these ugly side effects. The neurologist knows our plan. They cant say anything about the oil, but they agree to my goal. That in itself makes me feel good about the decisions we have made over the last year. We have been working with some natural health options as well over this last year. We had heard that using certain essential oils could help Erin and have dove into that world. Frankincence seems to help a little with bringing her out of a seizure that lasts a long time. Emergency rescue meds dont work for Erin so this has been a blessing! Also we have met a wonderful lady who does massage/rikki and reflexology. She has helped us immensely! Both Erin and mom are generally in a more calm state of mind. Since Erin feeds off my emotions - good or bad - it has been great for Erins emotional well being to be around a very calming well grounded mom, and likewise for mom! We see her again this weekend and we both look forward to these treatments. The big news is that Erin turned 18 this summer! We had a big party for her. She was so excited!!!! I thought for sure it was going to be a crazy seizure day that day. It was a very hot muggy day with looming thunderstorms in the distance. She was looking forward to the party all day. We had company coming and going to see Erin as well as many phone calls during the day. Our facebook page lit up with messages and she wanted to know what everyone of them said and who they were from. The excitement in the air was overwhelming. There were about 25 people here for her party that evening. She was spoiled with beautiful gifts. All of this mixed up in Erin's head was truly a recipee for seizures galore!!!! BUT other than 1 litlle, maybe 10 second seizure, while opening gifts, she did not have any seizures! She went to bed at midnight that night and was up at 9 the next day and still no seizures..... I give up trying to figure this out!!!! GOOD FOR YOU ERIN!!!! Of course with Erin turning 18 everything changes. She's an "adult" now, so all the help I was receiving thru children's services is gone. I had to apply to adult services, and that is not a little job. The system is messed up bad! I dont understand why it has to be like this. Its like Erin is a new citizen, dropped here from outer space. I had to get doctors notes, and fill out paperwork to proove again what is wrong with her and why she is dissabled. People from different adult ministries were here interviewing us and Erin. They asked what she wants to do. Ussually she says be an animal doctor, sometimes she wants to be a nurse, but really she is happiest playing with her baby dolls or being with her friends and family. Very frustrating. After all that work, she has her meds and gtube feeding supplies covered, but is wait listed for everything else. Even if I wanted to put her in a day program of sorts in our area she would be wait listed. If we wanted to put her in her own place or group home or whatever you want to call it - you guessed it she goes on a wait list.... uggggggh...... Thankfully in the last year, we have had nursing help added and we will be able to keep that! We have 2 lovely nurses that each come for 1 night a week for 2 hours (so I have help on 2 nights a week) And also a PSW comes for an hour before the nurses get here to bathe Erin and get her in her jammies. So thankful for for these 2 nights a week! Any other respite besides these 2 nights/week I get from here till she's off the wait list, will come from our pockets. She can stay at the high school till she turns 21 - this will be the biggest area of respite for us for the next few years. So, being September, Erin is back at school. She is so happy to be back. She is so social that staying home with mom must be boring for her. LOL The older 3 are all grown up and working and moving on with their lives, as they should, and we are so proud of them! Erin misses them terribly and has requested them several times for special things and visits. And they come and she shines with happiness! Boy do I have a lot to tell you! Erin has been having a rough 18 months or so. She is still generally our happy girl, but has been having a lot more seizures. Her seizures are more frequent, last longer and her post dictal (the time after a seizure) is lasting longer too. Some of her seizures are lasting 6 - 8 minutes with atleast 5 minutes of post dictal, followed by an hour of sleep at minimum. This has really messed up her sleep patterns, and there are some long sleepness nights around here (atleast 2 -3 nights per week). Our neurologist has upped her Keppra dose, but it has done nothing but make her ankles swell and she gained about 10 pounds. We have weaned off the ketogenic diet, as we didnt really see any difference on it. Although because of the diet we learned that Erin has a cronic constipation issue. It seems that giving her Restoralax daily has helped with that. Her meltdowns are happening more frequently as well, and it is harder for us to calm her during one of these episodes. As some of you may know, I have been looking into medicinal marijuana. More specifically I have been looking at Charlotte's Web, a high CBD low THC variety that was bred specifically to help children with seizures. There has been some very high profile news coverage on this, and that is really what peaked my interest. It is important to me that you know, that I have been the anti drug mom, just ask one of our older 3... lol... This mindset is the reason that I have researched, and researched some more, and prayed and prayed some more. And finally, here I am still with caution. I sure have learned a lot in the past 18 months. I am not going to write all of it here, but here are the basics that everyone needs to know, and honestly our politicians and medical people need to know this too. THC = the chemical part of marijuana that produces the "high"
We as humans all have CBD receptors, and require CBD's for a healthy whole body. After a long wait and thankfully a change in the law here in Canada, I was able to order and receive our first bottle of Charlotte's web. By the way, Charloote's Web is high CBD, low THC. I really wanted to start with that one, because it is made ready to use, with all the lab work done for strength etc. Otherwise I would have to make the oil here myself, and send it to a lab for testing. If Charlotte' Web is infective for Erin, I may eventually be making an oil here anyway, but this seemed the best and most practical place to start. We are seeing a doctor in Toronto who has a CBD clinic, as I did not want to hurt Erin in anyway and feel much more confident knowing I have some medical help. Our neurologist is not thrilled with our decision, stating the medical world does not know the side effects of CBD. My argument has always been that we know the side effects of the meds and they are not good. In Erin's case, the Valproic Acid is hard on the liver and the Keppra is known for weight gain and mood swings. And we are not getting good seizure control, so why do we not try something else? I have always fought for quality of life for my Erin, and continue to do so. So on August 4, at 3 pm, she had her first dose of CW. She gets 0.43 mls three times per day. I am so happy to tell you that on Aug 8 she had her first seizure free day since Noveember 13 of last year!!!!! And another seizure free day on August 9, and again on the 13th. The other days in the last 2 weeks since starting have had minimal seizures and they are less severe lasting not near as long. She actually has only had 2 seizures in these 2 weeks that remotely look like the seizures she was having every day before starting the oil. Her post dictal is basically zero and there is no sleeping after seizures!!!! We go back to the CBD clinic in September, and find out if we need to adjust the dose. If we get a whole stretch of seizure free days, I will be asking the neurologist to help me start weaning some of her meds. Remember earlier I said the neurologist upped her Keppra dose? I took that away the increased dosage on Aug 14, and she is doing great! She seems to be very clear minded - not so foggy, and we have not had a meltdown in these two weeks! I am thrilled and so excited to be on this journey. So I will fill you in as we continue on this new path. By the way, Erin broke her foot in May, wore a boot for 6 weeks, healed up great, and yesterday, tripped and broke the same bones on her other foot... she's back in the boot for now. Have a great day! Until next time! Erin has started her second year in the special needs program at our local high school. She is so happy there and has made some good friends. She loves gym class, where she rides her bike and plays on the gym mats, and they also go to the workout room, where she walks on a treadmill. I have asked her to walk to florida for us, as it has been very cold here, and she laughs and says ok mommy. The class works on life skills mostly, like cooking and delivering mail and general things that help with daily living. She likes to help in the kitchen, which amazes us because she cant eat what they prepare. They also take trips to the grocery store to buy what they need to prepare the meal. Again, Erin loves this trip, even though she cannot eat any of the items they are buying. For the most part she has been healthy since my last update. She has started to menstruate, although its not very regular. Thankfully. I say that because we have learned that just as she is extremely social, and very agreeable and sweet, when she is PMS'ing she is completly the opposite. She is extremely grumpy, anti social, and un-agreeable and unconsolable. It has made life quite interesting, and poor dad and big brother have to give her lots of space during those times. I have figured out that a dose of advil (ibuprofen) sure takes the edge off her mood swing. And just as quickly as she turns into the dark side she returns to our sweet little Erin. On January 2 we started her on the Ketogenic Diet. Basically it is a high fat, high protein, low carb diet that forces your body to burn fat for energy. This causes the patient to produce Ketones which can help reduce seizures in some cases. There is actually a really good explaination of the diet on Wikipedia if you are interested in learning more. The one good thing about this for me is that I can feed it to Erin through her tube, instead of having to cook everything required for the diet. There is a powdered mix called Keto-Cal that I add water and protein powder to, and use for her tube feed. It is a strictly monitored diet. Everything is weighed. I have to keep track of her blood sugars as well as her blood ketones. It has been a lot of work! My 2 older girls are not home much anymore, and it has been tiring taking all of this on, but there is basically a 60 % chance that it could work, so we must try it. It has been about 8 weeks since we started the keto diet, and we are not seeing any changes to her seizures or frequency yet. They said to give it 8 - 10 weeks. Erin has been having an average of 3 - 4 seizures per day for a least the last 6 months. It's been a while since I've updated this page. I hope you all had a wonderful Christmas and may 2014 be your best year yet! It was busy here with family and friends, and I admit I was exhausted after all of the celebrating and eating and visiting, but it sure was nice having family and friends around the table chatting. Erin has been doing well. She loves school and is very happy there. It has been a little difficult getting her back into her routine, after the holidays, but slowly we are getting there. Today Erin was home and spent most of day on the couch. It was a crazy seizure day. She started seizuring about 8 this morning, and in between naps, continued having seizures all day. Mostly drop seizures and some absense seizures. Of course we are trying to figure out why, but sometimes there just is no rhyme or reason, and we have to carry on. Hopefully the night goes well, and she sleeps thru. There has been lots of flu/cold bugs go thru the classroom, and so far, Erin has not come into contact with any major illness. Hopefully that trend continues as we get thru the rest of the winter. She has come up with some hilarious comments lately, that have Jim and I on the floor laughing. One morning while I was brushing her teeth, she started sputtering and pulled away from the toothbrush to spit in the sink. She then yelled at me "mommy WHAT are you doing to me?" The toothpaste was a different one then I ussually use, and I guess it was a little hotter than what she liked. Jim and laughed for a long time after that. Good for her for letting me know she didnt like the new toothpaste. Thank you everyone again for all the great feedback for this site! We are finding families all over the world that are somehow affected by this syndrome. I cannot explain in words how great it feels to know we are not alone. Until my next update - take care! Hi everyone! Well I am pleased to tell you that starting Oct 21, Erin will have an E.A. and she will be in the class she really belongs in. Thank you everyone for your support! It took a lot of calls and I left messages every where. I even called my MP and the ministry of Education. All of sudden I got a call that if Erin qualified for a certain program they could move ahead with getting her in the right class with an EA. She qualifies - by the paperwork - we still need approval from the higher ups, but based on the questions asked in the paperwork, she will qualify. As a parent of a child in your board, I feel it is necessary to write this letter. My hope, of course, is that this letter will help current and future students and not be thrown away and for ever forgotten. For the past 6 weeks, I have had to fight for my daughter’s right to have an educational assistant, even though her IEP clearly states that she needs one due to safety concerns. She transitioned to high school this fall, and unfortunately her health has not changed over the summer. It will never change – it is who she is. We had MANY meetings in April, May and June with all parties concerned. The staff at my daughter’s elementary school explained in detail my daughter’s needs, strengths and weaknesses to your board staff, and still I have had to spend the last 6 weeks fighting for what she needs. Those meetings were a total waste of my time and your staff’s time, if nothing said at those meetings would affect her placement and needs in September. Having come from an all-inclusive environment, I had hoped that would continue into her high school years, but without enough E.A.’s on staff, that has not been possible. She was placed in the M.H. class, where E.A. numbers are higher, instead of the D.D. class where she belongs. Most of the students in the M.H. class are for the most part non-verbal and this is completely opposite of what our daughter needs to continue on the path of learning that she has been on. We have all worked so hard with our daughter to always strive to do more than thought possible. She excels around her peers, for instance her speech and language always was better when she was pushed to achieve higher. Of course, I was never told that not enough E.A.’s was the reason, only that with her O.T. support and nurses coming in to do her feeds, that was the best class for her to be in. Unfortunately due to health and mobility concerns, and again really not enough help, that whole class is stuck, for the most part, inside those 4 walls. What a huge missed opportunity for the rest of the student body not getting to know those kids, and having a chance of making them feel part of something! My daughter is now being moved to the D.D. class and will get an E.A. thanks to the ------- program. My hope is that she will finally be able to feel like she is part of the whole school body, as an E.A. would be able to take her out into the school body more often. My question to you at this point is why wasn’t the ------- program thought about in those meetings in the spring, if you knew she would need an E.A. then? Why did I even have to fight and advocate for my daughter when you knew all of her history? How many children are there within your board that truly need an E.A. that don’t have one, because their parents don’t have the resources or knowledge to advocate? I draw your attention to your own special education guidelines from your website. 1- Public education is group education. 2- The diversity of our student population is valued and informs program and delivery. 3- Fostering an inclusive culture in schools is paramount. 4- Educational resources are allocated to reach education goals. 5- Resources are allocated to support the classroom teacher. 6- The classroom teacher is the greatest resource in the education system. 7- Placement options are guided by least restrictive/most enabling environments for learning. From my experience in the past 6 weeks, you are not following your own guidelines. In my daughter’s case, I can go thru the list, and say no to every single one of the points, except for number 7, how can they be a great resource if you don’t listen to their needs. They are in the field working with, in some cases, extremely high needs students and yet their hands seemed tied in a way that they cannot give the student what they know he or she needs. The teachers and support staff in each school are the ones in the field, directly working with the students and their caregivers. These professionals know the most about each of their students, and yet it seems that everything comes down to what you (the board) have to say, even though you are not the ones spending countless hours at the student’s side. Of course I understand that you have budgets to watch, bills to pay, labour issues and political jargon, but please don’t tell me that your students come first, when you are not even listening to the people working directly with them. For the record, I am not pro-union, I am not getting involved with any of your labour issues, nor am I speaking of any employee of yours in particular. I am a farmer and a farmer’s wife; I am a mother of 4, who is blessed to live in this country. This is about my daughter and all students, but especially, the special needs students. I have been putting off giving you all an update on Erin's transition into grade 9 because I am having such mixed emotions about it. My husband and I toured 3 local high schools a year before Erin was to start, asked a million questions and thought hard before making a decision on where we wanted her to go. We chose what would have been her home school (the school all the kids in this area can go to) for many reasons... 1) it is her home area school 2) it is closest to home 3) it is close to our doctors office and ambulance etc and many more reasons, but most importantly because the principle at that school told us that Erin's class (a developemental dissabilities class, that has their own room within the high school building) is a big part of the school body and they do many things within the school so that they are included. Making the decision was so easy at the time, but now I am not sure that I made the right decision. On the first day of school, there was a welcome assembly for all the grade 9's. Erin knew this assembly was coming and so excited to go to it. She never got to it. The staff was too busy with all the new kids and new routines that the assembly was not thought about for that class. Today was grade 9 day, and there were school wide festivities including a bbq. Erin's class was not included. I am getting very upset. I have talked with the principle and staff involved. The staff are all great and I know that their hands are tied. They are also short staffed and are doing their best with these kids. But these kids deserve so much more and the 4 walls sorrounding them. I guess I am going to have to turn into a bitchy mom, because I cannot leave Erin in that situation much longer. Erin has always been in an all inclusive school. This is what we have always wanted for her. She has always had an educational assistant, for safety reasons (seizures), but also for learning. She has always had modified programs so that she could be with her peers, but with expectations that matched her learning abilities. I always told the educators and staff that worked with Erin that all inclusive education had a fine line, in that as long as Erin was not interupting other students' education in the class, I wanted her with her peers. I also believe, and have seen it personally with many of her peers from the last 6 years of school, that being an all inclusive school will help those other children in the class more than it will help Erin. Our society needs to learn to be all inclusive, and our special needs children need to learn that they are included. We all bleed red. Ok so pm me on facebook if you have any advice - I will be fighting a fight for my Erin, and for all the other special needs kids at this high school and I will win (actually Erin will win). Well it's been almost 2 months since Erin's Gtube surgery. She is doing great! She has adapted quite well, and so has the rest of the family. We had a checkup about a month after her surgery, and had to cut back on the amount of her feed because she was gaining weight to rapidly! She looks great and has been growing a little taller as well. As usual, she is our happy girl. She has had no food at all by mouth. We decided that was best, as we didn't want Erin to think it was ok to have a snack or treat whenever she wanted, and in time undo all we have gone thru in the past 2 months. This being said, Erin has not asked for anything, other than the occasional time, at which point we hook up the pump and feed and tell her she has to have food thru "Eva". She has had an amazing attitude about all of this and there really has been no issues with her wanting food by mouth. Her birthday was on the 20 th of this month, and she did ask about a week ahead of her birthday if she could have cake. Oh boy, that pulled on the heart strings... We decided that she could have a piece of cake on her birthday. We were all together at the table and brought out her cake and sang happy birthday. She was beeming from ear to ear. She very slowly and very carefully ate about half of her piece of cake. Every once in a while she would lean into me, and say thank you mommy. Oh boy, the heart strings... I thought the next day she would ask for more cake (as there were leftovers) but nothing - she was content with having cake on the day of her birthday. The doctors told us that as long as her feeds are keeping her satisfied, she wont feel hungry, and I'm assuming that is exactly what is happening, because she really is not asking for anything. She starts "big girl" school on Sept 3, and is very excited about that. That is the next transition, and I'm looking forward to it for her. That will probably be my next update for you. Until then, take care! Just thought I better take a minute and fill you all in. As most of you know, Erin had her G tube surgery on July 3, and she is doing really well! We were at the hospital for 4 days. Erin did really well in and out of surgery, and she is tolerating the feeds well. We started at the hospital on continuous feeds of Pedialite, and then to "Compleat" (the tube feed formula) at a low rate continously. Then they slowly increased the amount, to make sure she could tolerate the feeding. When we left the hospital, Erin was getting 250 mls over an hour every 3 hours, and quickly moved to 350 mls. Those 4 days and nights were LONG!!! I was feeding her every 3 hours around the clock. I had forgotten how tiring it was feeding my babies. By July 9, we had the go ahead to feed Erin 5 times per day, with no night feeds. Ahhh, sleep! Erin has done really well, adjusting to the tube feeds without issue. She has asked for food by mouth a couple of times, and even though on the inside I was feeling horrible, I told her no and that she had to have all her food through "Eva". We are telling her that her food is the same as we are eating, for instance, if we are having chicken, potatoes and brocolli, that is what she is eating. She is believing that, and has even asked for spaghetti, so I root through the box of her formula, until I find the one marked spaghetti. Thankfully she cant read, because they are all the same - no flavour!!! That being said she does seem very "clear" in the last few days since her surgery. By this I mean she is sharper than usual, answering questions directly, and coming up with some pretty amazing sentences. So, maybe all this nutrition going in the right place is paying off. We have had a couple of days of more seizure activity, but right now I'm assuming its weather related. It's been extremely hot and humid here this week. Otherwise we are not seeing a difference in seizures, still averaging 1 - 2 per day. We go back to the hospital on the 26th, and depending on how she is healing, they may put in her "mickey" at that time. Right now she had a tube sticking out of her stomach, and as the hole heals up, they will replace it with a mickey, a button that will be flush with her skin. Thanks for all the prayers and well wishes and I will continue to give updates as we move along this new road. Last night was the graduation ceremony for Erin's grade 8 class. She was beaming with excitement and so proud of herself! She won an award for compassion, and while on the stage receiving the award, she was so happy and the whole audience was clapping for her. Mom had tears of joy running down her cheeks... What a beautiful young lady she's turning into! Today we had our pre-op appointment at the hospital. Her surgery is now booked for July 3 at 9 AM. While we are still a little nervous about the whole thing, we are at peace with it, and we will figure this all out. Erin has had an amazing attitude about it all and we will follow her lead on this. I will update you all as soon as I can after the surgery. Hi everyone! I thought I better take a minute to let you all know what is happening with Erin. The surgery will happen sometime in July. She has been doing really well, with one bout of pneumonia in april. She is still gaining weight and she is also growing in height right now. 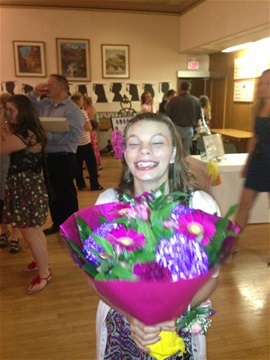 Her grade 8 graduation is coming up on June 25 th, I will post some pictures and give you another update at that time. She is, as always our happy girl. Until next time, take care! Hi everyone! We are still waiting for a surgery date, but I wanted to update you on what's new with Erin. Over the last 4 - 6 weeks, Erin has stopped drooling!!! About 6 weeks ago, we noticed that her bib was staying dry over the course of the day. One day at school, she asked the E.A. to take her bib off. She did not want to wear it. Since she was not drooling, the E.A. gladly took her bib off, putting it back on occasionally if Erin was drooly or when she was eating. Now she doesn't wear a bib at all, and we are all so proud of her! She gets drooly during and after a seizure, but as she recovers from the seizure, so does the drooling subside. We have asked the surgeon and her neurologist if they knew why, but there is no real answer. Although the surgeon said "in the medical field we call that a miracle". We really like that answer and if that is what it is, then Alleluja!!! We have had a regular appointment recently with the neurologist, and all is well, although he is quite perplexed about Erin not drooling anymore. We have been on a wait list to start the ketogenic diet, and that will happen soon. It looks like we will begin when we are in the hospital for the G tube surgery. If everything goes well with the surgery, and since we will be there for some time, it would be a good time to start, while all the medical team is close by for observation. On another note, when we were at the video swallowing study in the beginning of February, Erin weighed 76 lbs. On March 18 th, at the neurologist's, she weighed in at 81 lbs! Erin is doing really well right now, gaining weight and a very happy girl. Until next time - take care everyone! And Happy Easter!!! We have had our appointment with the surgeon. It was a good meeting. He explained what happens in the surgery and how the G tube is put in. He was a very nice man - perfect personality for a pediatric surgeon. As usual Erin made friends out of perfect strangers. She told the doctor that her new "button" is named EVA and wanted to know when she is coming because Wally needs a friend. He said he has never had anyone name their G tube, and wrote implant "EVA" on his surgery notes. So now we wait for a call from the hospital with the surgery date. When the surgery happens, we will be there for about a week (2 - 3 days to make sure Erin recovers well from surgery - there can be increased risk of infection being an open wound to her stomach) and then making sure we have Erin's food intake good, and training time for me with the G tube and pump. My next update will be to let you know the surgery date. Right now Erin is doing well, still having an average of 1 seizure per day and eating only pureed food, but still our happy girl. Jim and I decided to have a talk with Erin and try to explain to her about tube feeding. She kept asking why do I have to have my food go in a tube? We tried to explain that she is not swallowing very good and that this will be better for her and she will feel better. I don't think she really understands the whole concept, but she is happy. We explained that she would have another button on her tummy where the tube will be attached. As soon as we talked about this other button, she got really excited and started jumping around. She said YEAH! now Wally will have a friend! (When Erin was much younger she named her belly button Wally) Oh she makes me smile - all the worry we had about trying to explain this to her, and have her really understand, was totally washed away with her innoscent happiness that Wally would have a friend!!! Our first appointment with the surgeon is on March 5. I will make another entry after that appointment to fill you all in.